at the "darker" side of living with cats!!! I knew the second I first read that one of my favorite cat-people, Rosa Silva, was publishing a book, and the second that I read the title, Stop Meowing and Go the F*ck to Sleep, that this book would be right up my alley! I was right, it TOTALLY is! While I am insanely in love with cats, I would be lying if I said that every single moment was all sunshine and roses. Cats rule our homes, they rule our lives. While cuddly and endearing, they can be annoying little "SOBs"!! If you are saying that your cat(s) are perfect, I am calling you out on a BIG. FAT. LIE. While I adore my cat, Cody, (and Angel Bobo, "the one who came before"), there are (and have been) moments that have been beyond exasperating. Moments where I have called my kitties names involving "HBO words". Many of the moments that have been particularly annoying, have involved trying to sleep when a cat has decided it is time to be AWAKE, because they have other things that they are thinking of. 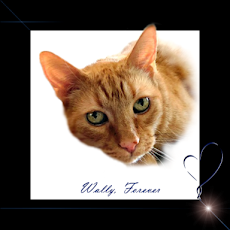 For many cats, and my Angel Bobo, those thoughts usually involve playtime, but Cody's thoughts always involve FOOD. The relentless quest for food. In our case, it is my husband who is the poor "victim" who loses sleep, because he does the morning feedings and because I can pretty much sleep through anything. But, even I have my moments where Cody's incessant meowing is on my last nerve, and I will yell at him to "SHUT THE F*CK UP!!" Not to be deterred, Cody will meow incessantly, jump back and forth across my husband's weary head, cry, knock things over, and more. He will do anything in his quest to wake my poor husband up. 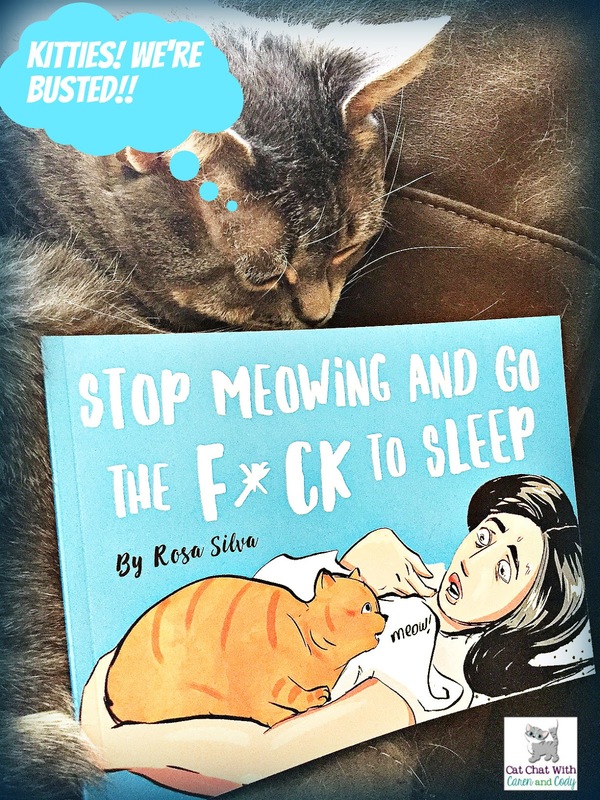 Stop Meowing and Go the F*ck to Sleep by Rosa Silva, addresses these moments in a nod-your-head-in-recognition accompanied by belly laughs kind of way, in a style reminiscent of children's books, but in this case, the book is definitely for ADULTS ONLY!! For all the crazy cat lovers out there, sometimes that crazy could be because your feline friend will not let you get any sleep. Inspired by, and in the tradition of Cortes and Mansbach’s adults-only bedtime story, Go the F*ck to Sleep, Stop Meowing and Go the F*ck to Sleep is a funny take on the frustrations of losing sleep because of a feline friend. The struggle is real. Anyone who is a cat lover knows that the cat rules the roost, and that certainly doesn’t change at bedtime. You might be ready to sleep, but you can bet that kitty is ready for just about anything but some shut-eye. 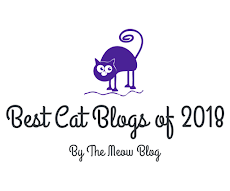 Release your frustrations with a good laugh as you read along with Rosa and her struggle to get Mr. Cat to Stop Meowing and Go the F*ck to Sleep! Stop Meowing and Go the F*ck to Sleep is a funny bedtime book for all the desperate cat parents out there. If you have experienced the nightmare of having a kitty who won’t let you have a good night’s sleep, this is the book for you. It’s the perfect gift for crazy cat lovers who appreciate hilarious insights into the feline nature. It would make a great gift for any cat lover! 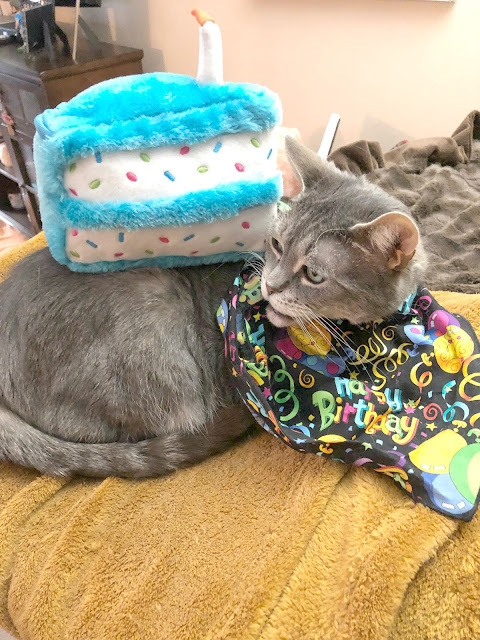 Be it a get-well gift, a "newly-adopted-cat" gift (hehehe), a birthday gift, it would be a gift that would be sure to make the recipient smile. 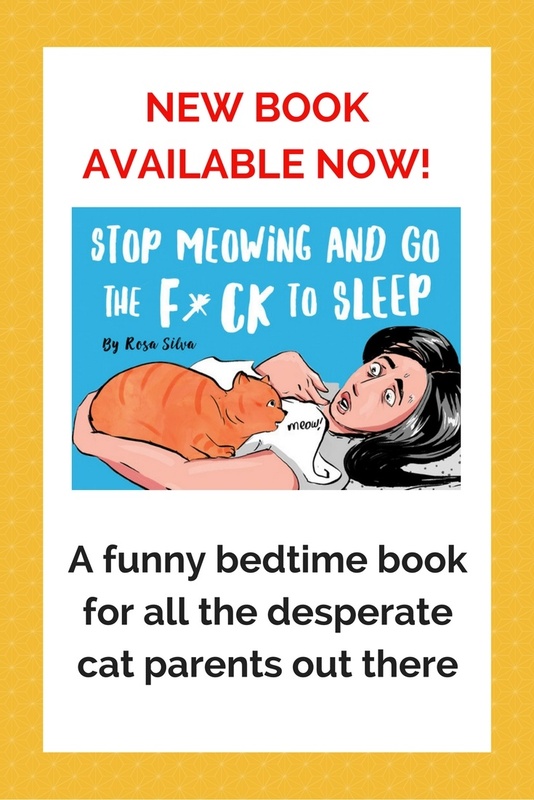 I think many of us can use some fun in our lives right now and Stop Meowing and Go the F*ck to Sleep By Rosa Silva fits the bill purrfectly. Knowing author Rosa Silva as I THOUGHT (the operative word being "THOUGHT" that I did! ), hearing her even utter a frustrated thought about her beloved Mr.Cat, or utter an objectionable word would be something that I would NEVER expect. I LOVE books with unexpected "gifts" and the "gift" for me, (other than the obvious, that this book totally cracked me up! ), was learning something new about Rosa. It endeared her to me even more! Rosa Silva is an author and blogger. When she's not working on her next book, you can find her reading, chilling on the beach, hanging out with her cat, or writing the next post for her blog Cat Lady Confidential. Stop Meowing and Go the F*ck to Sleep is her first book. I give "Stop Meowing and Go the F*ck to Sleep" By Rosa Silva a resounding 4- PAWS UP!!! Rosa has generously offered one of our readers who is 18 and over and who RESIDES ANYWHERE IN THE WORLD a chance to win a copy!! (A $9.99 value) Entering is super easy, just enter on the rafflecopter below, and good luck!! In full disclosure, we were not compensated for this review/give-away. We were sent a copy of this book in exchange for our always honest review. That sounds like a fun book! The only thing that got me to "shut the $% up" and go to sleep wuz leaving twinkle lights on. Year round. Good thing my momma duzn't require dark to sleep. Thank you Caren for such a wonderful review! I'm really happy that my book made you laugh! 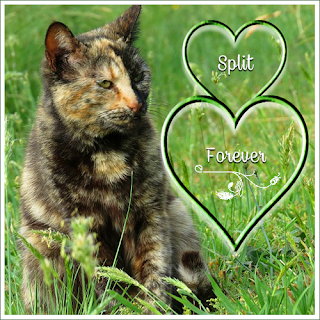 My goal when I wrote the book was just that - to make cat lovers have a good laugh because, like you wrote, we all know that sharing our lives with a cat is not just sunshine and roses. Rosa you are most welcome!! Oh I loved it!!! I learned an entirely new side of you that I NEVER knew (and I LOVE IT!) and you captured how we feel, it was just adorable, and the illustrations are purrfect!!!!! It was my pleasure to review it! Ha!!! Yes!!!! That is what is so great about it, we ALL know cats who this book could be about. Looks like a great book. I am in! It is!! Good luck to you! Oh, that sounds hilarious! Much as I love my cats, I am sometimes "inspired" to hurl some HBO words at them! It is! Thanks for your honesty because you make those of us, (like me) who often "hurl HBO words" feel less guilty! I love my cats dearly, but I really need to read this to them! Oh you are NOT alone!!!!!!! Poor Cody, you should hear what I say to him sometimes.... I am a MEAN MAMA!! lol!!!!!! If you entered, good luck! It's a world-wide give-away! Thanks for this wonderful giveaway. Mt cats are too needy, noisy, after me affection and never stop turning and getting in closer and pushing me towards the cliff. you are welcome!! lmao about "the cliff"
Everything from headbutting me to trying to climb under the covers with us to chasing each other up and down the halls at 3am. I was lucky to have good kitties at night. So lucky. I started laughing just reading the title of the book so I can imagine how funny the actual book is. I purchased my copy when I saw her announce it was on sale, so I won't enter your giveaway. But anyone who wins will surely love it! so happy that you loved it too!!!!! this title is hilarious and so very familiar! Cheers! OMG! This looks hilarious! WANT! We jump all over mom when she's trying to sleep cuz we want to play! I tried to put my address in but when I hit enter to make a new line, the box closed and I couldn't open it again to finish putting in my address. I can dm you via twitter with it if you like. thanks for the heads up...if your name is selected I will get a hold of you. I sure don't like the title though! That sounds like a very funny book!! I've read the original version, "Go the F*ck to Sleep," and if this one is anything like that, I'm sure it's hilarious! What a hilarious-sounding book, and we're sure someone will come out with one called, "Stop playing/walking all over the bed/scratching in the litter box/clawing at doors/pouncing on toes and go the f*ck to sleep! Mes was serenading Mommy and our roommate Pat in the hallway between the bedrooms last night! Pat realized mes wanted to goes downstairs and it was too dark, so he turned on the light for mes! Mes went downstairs, realized that Mommy had turned off my heating bed, so mes comed back upstairs and sat right beside her face, and MEOWED right in her ear! Mommy said "Shut the F** up!". So mes did! I definitely need this book. I can't tell you how many times I have yelled that to Frodo!! Last night in fact he carried his ducky up into bed and unfortunately it "sings" every time Frodo moves it-- Ducky's days are numbered! That may be a scenario that plays itself out here but then somemommy feels guilty and dishes out treats. She's wrapped around our paws! I love this book. I already have a copy so I will skip the giveaway. I don't have a cat, but one of my dogs is very cat-like in many ways. He demands to be up and fed at the first sign of movement in the morning (or earlier!) Knows right where to put his cold nose, too. That book sounds really funny. We used an app on Mommy's phone to color the pictures. It's called Recolor and it was free at the Play Store. Ahhhh, I thought so!!! Came out great! I just don't like doing it with the apps, I would rather do it the old-fashioned way, but yours came out great! Chimera baths me, Scylla bites me everybody else is polite and lets me sleep. I bet that book was written by a human type! I think we've all said things that are not fit for print when we're feeling sleep deprived. Our kitties have not ever been allowed in the bedrooms...so this might be less of a problem...but they are not creatures who are dumb by any means. Your comment cracked me up!!! xoxo Good luck!! Bwahaha! This book sounds flat-out hysterical! Thanks for the chance to win it, Caren and Cody. :) Hugs! It is and you are most welcome! ((((hugs))) back! Cats are cats. And we love them. Hisia is a sweet girl inside the house. The only moment I feel like "killing" her is when she doesn't want to eat the food that I want her to eat. How come something can be delicious one day and absolutly not edible the next day ??? Outside is another story. Sometime she is deaf ! It is!! MOL about Maurico!! 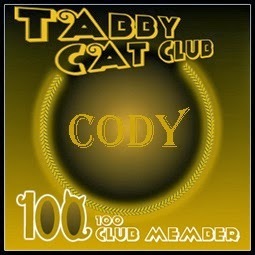 he should get together with Cody, but then again, Cody ONLY talks when he is bugging us for food! (((hugs))) back!